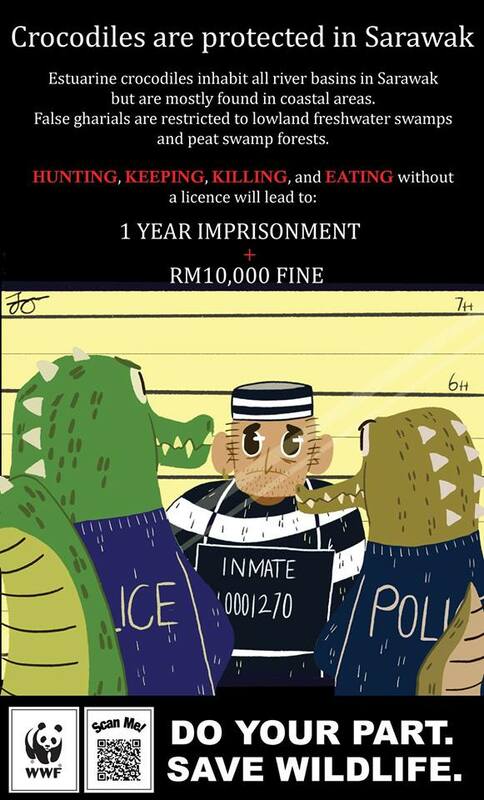 Think twice before you hunt, keep, kill or eat crocodiles. Kuching, SARAWAK: World Wide Fund for Nature Malaysia (WWF-Malaysia) and Malaysian Nature Society (MNS) Kuching Branch call for a careful consideration, and a stop on distasteful graphic display of whole bodied estuarine crocodile being barbequed and sold publicly at this year’s Kuching Food Festival. This action is giving a skewed public perception towards the reptile which is a protected species under the Wildlife Protection Ordinance 1998, and belittling our conservation and awareness efforts. “The operator may have a license issued by the authority to sell crocodile meat but such graphic display of a full length crocodile carcass at the annual popular public event does not give wildlife and nature the proper respect they deserve,” said WWF-Malaysia Conservation Director Dr Henry Chan. “We feel it is a distasteful graphic display of the species that has so much cultural significance to Sarawak. The crocodile was once made as the state’s football team mascot,” he said. To some ethnic groups in Sarawak like the Iban and Bidayuh, it is a taboo to eat crocodiles, he pointed out. Crocodiles also play important roles in maintaining our rivers’ ecosystems. “They clean up rivers as they feed on the weak, injured, and dead animals. This places a balance to the animal population in the wild. Over time, the crocodile population will self-regulate and reach an equilibrium. Without them or by disturbing or displacing them, our river systems may break down and eventually affect humans negatively,” said MNS Kuching Branch Chairperson Rose Au. “The Kuching Festival can still be a great event to promote the wonderful delicacies from Sarawak. We do not need such an apathetic display of our wildlife to boost sales,” she said. Currently, the state is working on a comprehensive long-term conservation plan for crocodiles and therefore, businesses and the public should not go on a rampage in harvesting and eating crocodiles for now. “We hope that the public will not adopt the perception that crocodiles are no longer a threatened and protected species. It is a wrong perception that anyone can openly hunt crocodiles and sell them. A license and approval from the authority is still needed to do so and only if the wild crocodile poses a threat to the safety of humans,” she added.